I am going to spend some time specifically looking into the GPU issues for the next couple days. Can everyone please post the exact issues you are having here? This includes quotes of the error messages you are seeing and any other information you think is useful. I've been going through old forums posts trying to decide where I think the problem is and I am still unsure where the problem is. don't know if this helps, but milkyway@home did not seem to find my GPU in the last few days (GPU missing under BOINC status). The GPU did work fine with other projects like SETI or Asteroids at that time. Could be related to the Win10 Anniversary Upgrade, or the latest NVIDIA drivers update (GTX 750 Ti here). At least Windows did not mess with the driver, as the nvidia one was still installed. But after reinstalling the same drivers (no clean install) milkyway is now again using the GPU so far. Message 65048 - Posted: 18 Aug 2016, 19:57:59 UTC - in response to Message 65046. I've been going through old forums posts trying to decide where I think the problem is and I am still unsure where the problem is. Are you thinking about use of anonymous platform to obtain work for recent AMD's gpus? If server cannot recognize correctly the gpu architecture is impossible to do automatic download of wus. There are too many computation problems with work units dated 1st August. The longer the work unit the more likely it is to be aborted . Has anyone else reported the same problem ? Is it the age of my computer at fault (6 yrs) or is there a problem with the data in the work units ? Looks like your problems are with N-body, please post them over in number crunching. It is not appropriate to post them here were we are discussing GPU issues. When you are running without the anonymous platforms, what do you see from the server? Do you get error messages? Does it just send CPU work units and pretend you don't have a GPU? What are you seeing on your end? I think your error was a one off due to Windows. Seems like a super minor problem with a simple fix. Going to focus on the other issues for now. Message 65053 - Posted: 19 Aug 2016, 7:48:03 UTC - in response to Message 65052. Sometimes "got 0 new task" (specially if queue is empty), otherwise like other volunteers "Ati does not support Opencl"
Are you going to address the issue that AMD cards can process 1.36 WUs only with 11.x, 12.x drivers? It doesn't work with the newest catalyst drivers? This is the first I am hearing of that. A year ago, when I have started crunching milkyway, only modfit worked with 14+ drivers, others gave computational error. I will try now latest drivers and let you know. Message 65057 - Posted: 19 Aug 2016, 17:02:22 UTC - in response to Message 65056. Okay. The catalyst drivers are notoriously broken so I am not entirely sure it is our fault that there is an issue. If more people report problems I will look into this one. Just installed 16.7.3(Crimson), for my R9 200(280x) and all works fine. Probably it was just an issue with Radeon 5970 I had previously. So, no issue. Sorry for hassle. No hassle. I've been saying I would tackle GPU issues for a while so I want to get them all squared away. Quick progress report: I am working on updating the BOINC API code we build into our clients to be up to date. Maybe this will fix some of the compatibility issues with more modern GPUs, maybe it won't. Its the only thing I can think of updating at this point that may provide a quick fix. If it doesn't work we will try some more drastic options. Expect these new binaries to be released within a week or so after they have received proper testing and compile on all platforms. Message 65061 - Posted: 20 Aug 2016, 15:31:18 UTC - in response to Message 65056. I had the same problem, only modfit workunits worked back then on my 5870. Today, everything is fine, I still have 2x5870 crunching both modfit and regular workunits without any problems. Awhile back I had a slight problem. BOINC was aborting all GPU work units. Found out I had a bad driver install. Reinstalled driver and the problem was solved, so far. 22/08/2016 17:20:56 | Milkyway@Home | Sending scheduler request: Project initialization. Since "modfit" is discontinued, I remove / add Milkyway to starts on fresh files. The 1st time I connect the manager, I get the "classicc" message as my R600 AMD gpu isn't recognize!! Now it only say me : "got 0 new task"
I'm on a Mac Pro 2009, OSX 10.11.6, 24Mo of RAM, AMD 7950 Mac Eddition from Sapphire & BOINC 7.6.22. 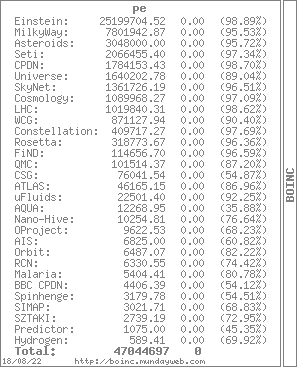 P.S: I've a look in the milky folder in the project folder of Boinc, it's empty, no files!! Message 65075 - Posted: 29 Aug 2016, 5:25:31 UTC - in response to Message 65060. Quick progress report: I am working on updating the BOINC API code we build into our clients to be up to date. Maybe this will fix some of the compatibility issues with more modern GPUs, maybe it won't.